An alien spacecraft approaches Earth on an intercept course, it destroys three Klingon warships and the Federation's Epsilon Nine space station; Kirk gathers his old crew and refits the Enterprise to confront the mysterious foe. 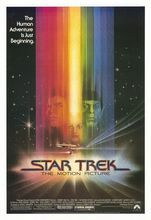 First Star Trek feature film, running overbudget at $46M. Received Oscar nominations for Best Original Score, Best Set Decoration, and Best Visual Effects. Received also a Hugo nomination for Best Dramatic Presentation.